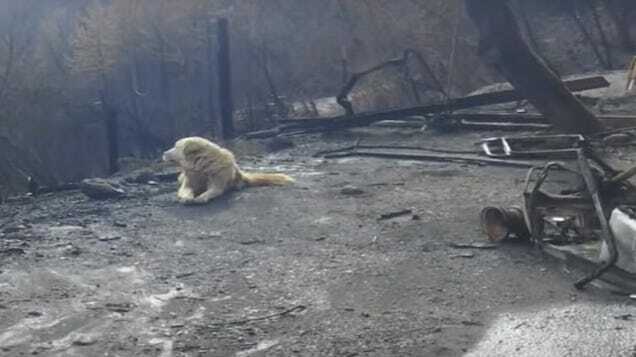 A good boy who survived the deadliest and most destructive fire in California’s history was found weeks later, apparently guarding the site of what was his family’s home. A business that was destroyed by the Camp Fire continues to smolder on November 9, 2018 in Paradise, California. When Andrea Gaylord was forced to evacuate the devastating Camp Fire in Northern California in November, she couldn’t get back home to take her dog Madison with her to safety as the fires spread. 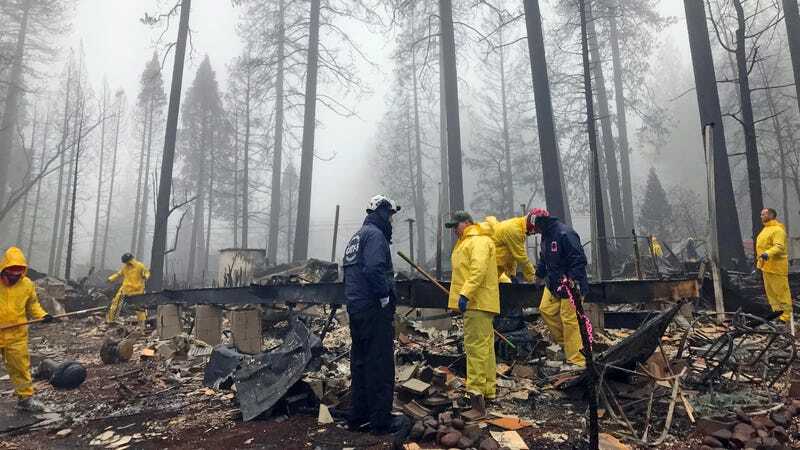 The evacuation order was lifted nearly a month after it was instated in Paradise, California, and Gaylord was beside herself to see Madison waiting for her as she pulled up to her burned down property, Gaylord told the ABC 10 news. Madison miraculously survived the Camp Fire that tore through Northern California throughout November, killing 85 people, displacing thousands, and leaving many, including Gaylord, homeless. The animal rescue group K9 Paw Print Rescue tried to find Madison, an Anatolian shepherd mix, but were unsuccessful for weeks, only able to glimpse him from a distance a couple of times, according to a Facebook comment posted by rescuer Shayla Sullivan. Although they couldn’t get a hold of Madison, K9 Paw Print Rescue did manage to find Madison’s brother Miguel, who had found his way to a nearby city. Sullivan noted that although she never got close to Madison, she would leave food and water out for the dog, and even put a piece of clothing that smelled like Gaylord on the property for Madison to smell. Gaylord, of course, was overwhelmed to see Madison waiting there, protecting what was left of their home, and happy to see him reunited with his brother Miguel. “You could never ask for better animals,” Gaylord told ABC 10. Protesters took over a California Public Utilities Commission (CPUC) meeting on power company PG&E’s safety culture Thursday morning, responding to the company’s possible role in starting the Camp Fire, SF Weekly reports. The hearing was part of a three year investigation into PG&E’s safety practices by the CPUC. PG&E, one of Californias biggest utilities, is suspected to be responsible for the Tubbs Fire last year, which was California’s most destructive and deadly fire in history until it was overtaken by the Camp Fire this month. It’s still unknown whether PG&E was responsible for starting the Camp Fire, but there are several indications that the company may be to blame. Investigations are still underway, but it appears that in addition to the Tubbs fire, PG&E could also be partly responsible for the catastrophic Camp fire which destroyed the town of Paradise and killed 88 people earlier this month. The company was considering shutting off power to the affected area of Butte County but chose not to; now, damage to an active transmission tower near the start of the fire is being reviewed as its origin point. When the power did go out as a result of the fire, some residents assumed it was due to the aforementioned planned outage, and were not aware it was due to a fast-moving blaze. The loss of internet, landlines, and television complicated evacuation communications. The utility meeting on Thursday quickly became a venue for outraged citizens to voice their concerns about PG&E’s safety practices. Much of the controversy around PG&E is the result of decisions by state politicians to bail out the company for past disasters. After the Northern California fires last year, California State Assembly members approved Senate Bill 901, which passed on some of PG&E’s liability for the fires on to energy consumers. The law was signed by outgoing Governor Jerry Brown. Another bill, proposed by Assemblyman Bill Quirk, would similarly help the utility evade paying for the lawsuits sparked by the fires. Protesters at the meeting demanded that the state avoid bailing out the utility for financial hardships that may be incurred thanks to the Camp Fire. Others called for PG&E to be either broken up or taken over as a public utility. A coalition of organizations including Mask Oakland, Local Clean Energy Alliance, East Bay Clean Power Alliance, Communities for a Better Environment, Diablo Rising Tide, and Democratic Socialists of America have started a petition demanding a stop to the bail outs. They plan to continue organizing around the cause. Emergency personnel and volunteers searching for human remains after the Camp Fire on Nov. 23rd. California’s nightmarish Camp Fire is nearly out after weeks of destruction, but firefighters are still finding new bodies even as the confirmed death toll has risen to 85. The fireline that remained uncontained has now been contained, bringing containment to 100%. Fire suppression repair personnel continue conduct rehab where possible. Search and Rescue Crews, US&R Teams, and engine companies continue with search efforts. Some 2,500 people originally believed to be missing after the fire have been accounted for, CNN added, though 249 names remain on a list of missing individuals. Recent rains have complicated search efforts, with search teams hampered due to fire-ravaged trees and structures that collapsed in the downpour and local authorities warning of flash floods and debris flows. Officials briefly overstated the confirmed death toll at 87 due to human error, the Sacramento Bee wrote. Thousands of people remain displaced, some in emergency shelters or hotels and some in makeshift campsites. In the long run, the Los Angeles Times noted, a Butte County homeless population already estimated at 2,000 is likely to grow, while other people are likely to leave the state. 41-year-old Leanne Watts, whose Paradise home was destroyed and is living with her family of six in a Yuba City hotel, told the Times her stay was being paid for until the end of the month by an attorney representing her in a lawsuit against Pacific Gas & Electric Co., a utility company whose electric lines may have sparked the fire. Beyond that, it’s unclear where her family will stay or how they will pay for necessities. 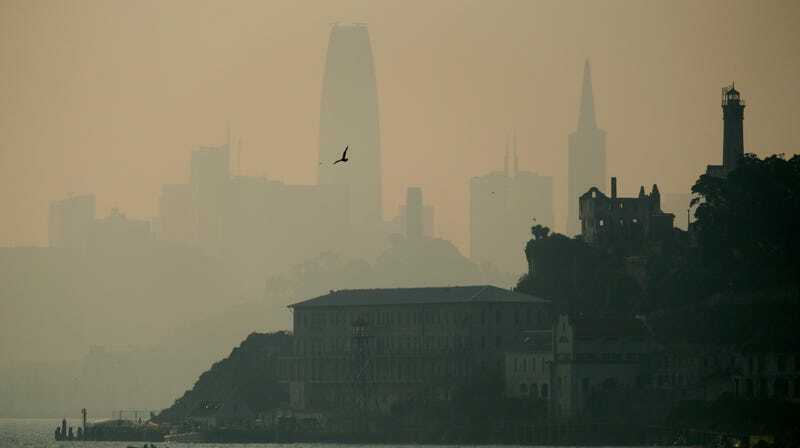 The San Francisco skyline is obscured by smoke and haze from wildfires behind Alcatraz Island Wednesday, Nov. 14, 2018, in San Francisco. Smoke from the wildfires that have devastated California for weeks has stretched some 3,000 miles to East Coast cities. The Weather Channel reported this week that the haze was expected to linger through Wednesday before an arctic chill descends on the Northeast over the Thanksgiving holiday. While pictures shared on social media captured a colorful hazy sunset, reports confirmed that smoke over cities like New York City and DC had traveled from the west. Meteorologist Gary Szatkowski shared a forecast map from the National Oceanic and Atmospheric Association on Twitter on Monday that captured the smoke plume moving across the United States. Reports of intensified sunsets following wildfires are common. The Washington Post noted that this phenomenon results from the way light interacts with smoke particles in the upper atmosphere. Smoke is made up of tiny particles from wildfires, which can provide more points for light to bounce off and scatter. This leads to the enhancement of the red and orange hues you see. A deck of clouds near the horizon also has this effect, allowing the sun’s rays to reflect off the clouds and to our eyes. California now has some of the most toxic air on the planet as the result of the wildfires, and thousands have been left homeless because of their destruction. At least 83 people are dead in the Camp Fire, the deadliest and most destructive fire in California’s history. The Camp Fire had burned more than 153,000 acres and 13,000 homes as of Wednesday evening, with nearly 5,000 other structures lost in the blaze. Hundreds of people are still unaccounted for following the fire that started three weeks ago, and fears are currently mounting that the process of locating victim’s remains will be complicated by possible flooding from incoming storms.